Merry Christmas Eve, everyone! Once again, I'm in a state of utter disbelief today, not only that Christmas is here, but also that I survived another holiday retail season and another 12 Days of Christmas posts! Well, it seems to have become a bit of a tradition for me to offer a big giveaway at the end, and you'll be happy to hear I have no intentions of breaking with that tradition this year. I just love doing it -- not only is it a great way to end the series, but it's also my way of thanking you for all of the support you've given me throughout the year. Plus, what's Christmas without presents? 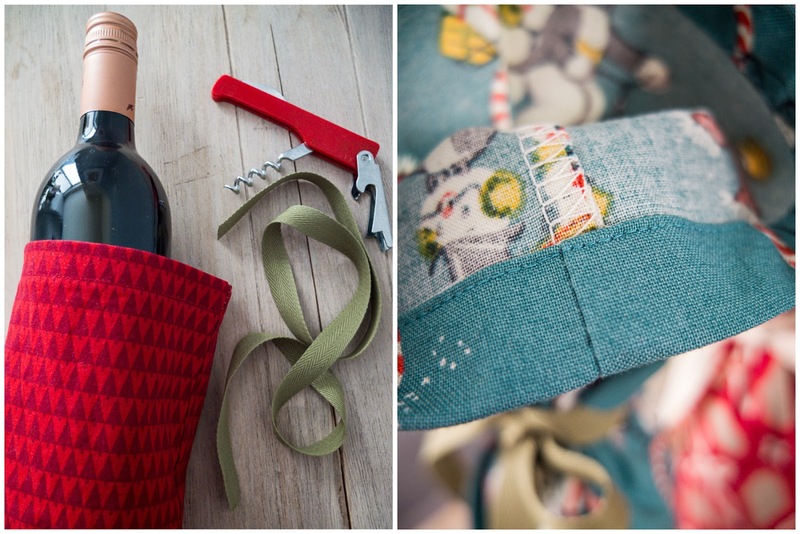 This year's winner will win not one, not two, but all three prizes you see here: a set of wine bags, a reversible tea cosy and a half apron! 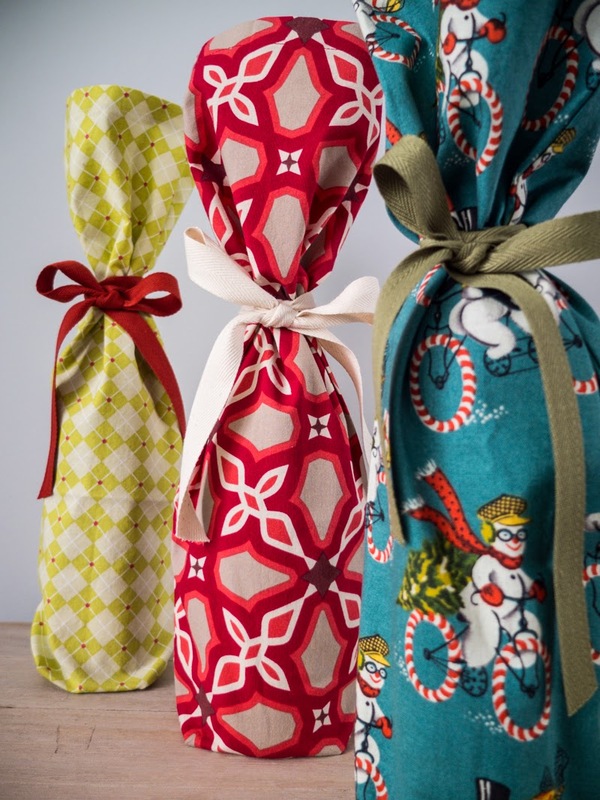 You'll be all set for hostess gifts next year — haha! All you have to do is leave a comment on this post letting me know which of my 12 Days of Christmas posts you enjoyed the most. Score extra entries by sharing this contest on facebook or twitter. Contest is open to all and closes when the ball drops, December 31st at midnight. With all the sweets around this time of year, I often find myself craving salty treats. How about you? Here a couple new recipes I've added to my holiday baking roster that will play nicely with your cheese plate this Christmas! This recipe is taken verbatim from Bon Appetit magazine, which I picked up for the first time last weekend. 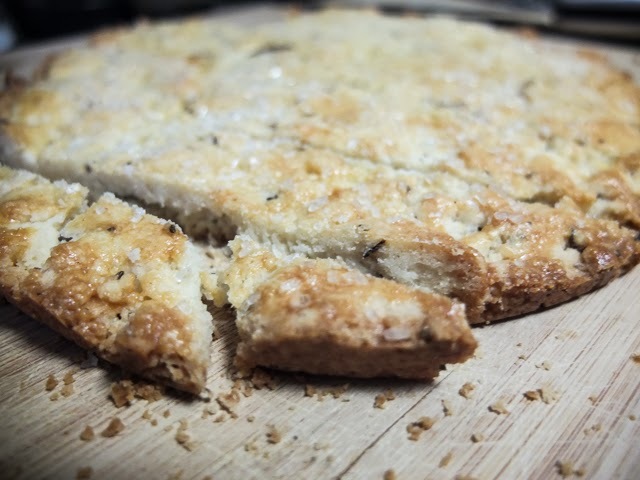 I always thought it was more for gourmet cooks, but was pleasantly surprised to find several recipes I'd like to try, like this savoury shortbread. 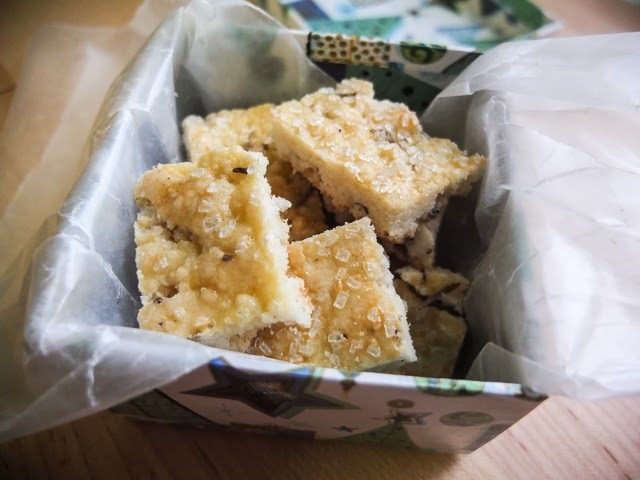 Although the end result is slightly crumbly, it is just as tasty as it sounds! A few recommendations: grease the pan, give your dough an extra pat or two, and don't over bake. Also, I used dried rosemary from our garden, so I used about 3 teaspoons, and it didn't stick to the top, so you may as well skip that step unless you're using fresh herbs. Preheat oven to 350°. Toast caraway seeds in a small dry skillet over medium-high heat, tossing occasionally, until fragrant, about 2 minutes. Coarsely chop and set aside. 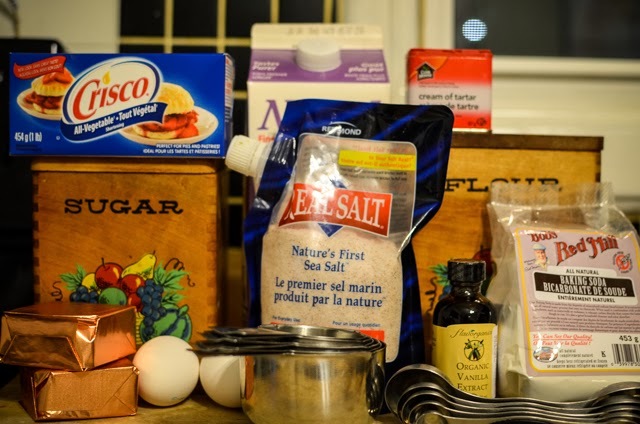 Using an electric mixer on medium-high speed, beat butter, granulated sugar, powdered sugar, and salt until very light and fluffy, 7–10 minutes (beating air into butter makes for tender shortbread). Reduce speed to low and add flour, caraway, and rosemary; mix just to combine. Dough will look shaggy and a little dry (it’s not!). Press dough into two 8” cake pans. 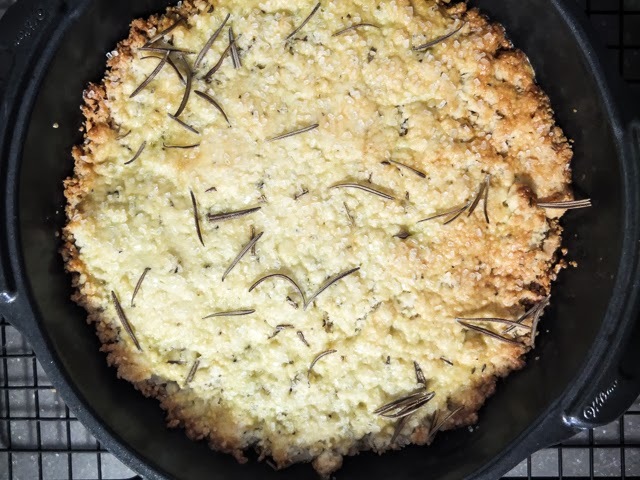 Brush with egg, sprinkle with sanding sugar, and top with rosemary leaves. Bake until shortbread is golden brown and sides pull away from pan, 20–25 minutes. Transfer pan to a wire rack; let cool in pan before turning out and cutting into wedges or bars. If you follow me on Instagram, you will know that I burned my first batch of this mix. Let my stupid mistakes be a warning unto you: the heat is low for a reason — turn it up and the honey will ignite. Oops. I've made a few changes to the original recipe, too. I swapped out Shreddies for nuts, because I found the Shreddies soaked up way too much of the sauce; I doubled the pretzels, because I love pretzels; and I decreased the butter by a tablespoon because it was too wet otherwise (all reflected below). It should also be noted that even though the recipe says to bake until the mixture dries out, it doesn't really do that no matter how long you wait and will dry more outside of the oven. I repeat: do not turn up the heat! All that being said, if you don't burn it, this mix is really yummy and addictive. 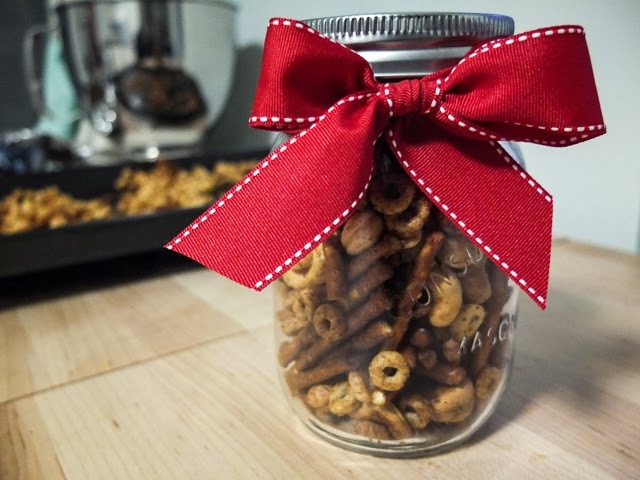 Perfect for nibbling once the board games come out or even to give away as hostess gifts, which I did last year. Preheat oven to 250°F. 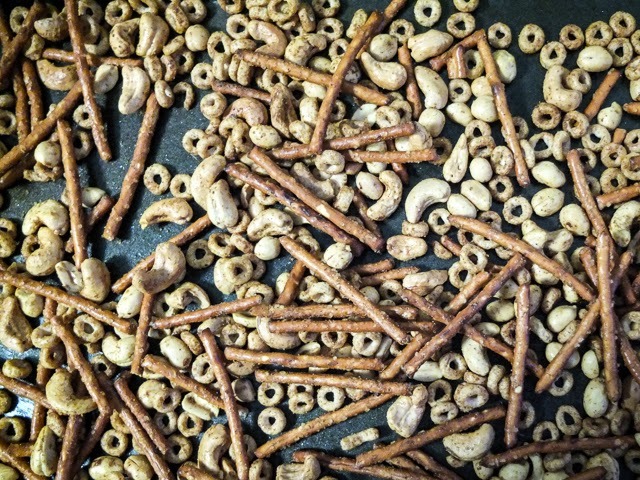 Combine 1 cup Cheerios, 1 cup nuts (I used cashews and peanuts) and 2 cups pretzel sticks in a bowl. Melt 2 tbsp unsalted butter and stir in 2 tsp honey. Drizzle butter mixture over Cheerio mixture and stir until evenly coated. Combine 2 tsp mild curry powder with 1 tsp garlic salt and sprinkle over Cheerio mixture while stirring, until well combined. Spread on a baking sheet and bake for 30 minutes or until mixture has dried out and become lightly toasted. Let cool on baking sheet. Stir in ¼ cup sultana raisins, if desired. Greetings, Dear Edna readers! De Facto Redhead here, back for another kick at the Christmas can, and this year I’m tantalizing you with some of my holiday baking. 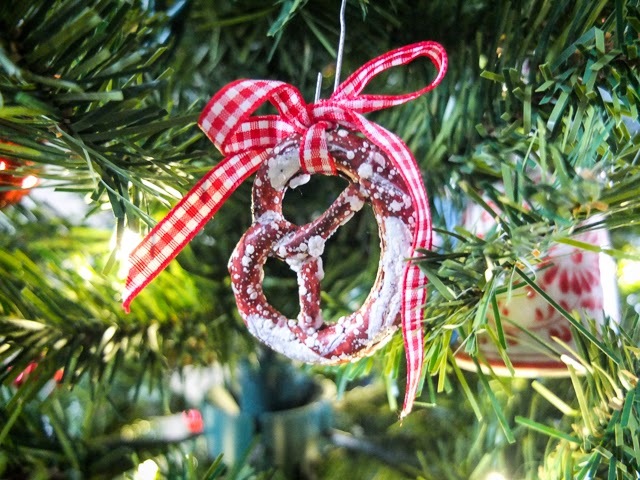 Over the years, Erin and I have complained about the pressures of the Christmas season, and how completing our baking in time for Christmas was impossible. Somehow, however, we always found the time to create tin after tin of cookies and squares, happily spreading our Christmas cheer, forgetting the pain until the next year rolled around. 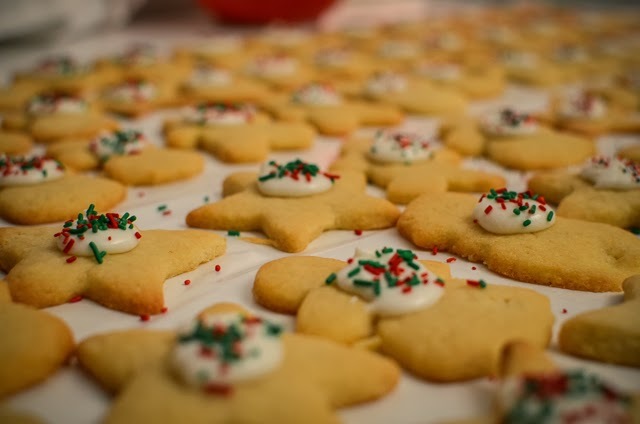 Well, last Christmas, I finally reached my limit — I was back in school in a program that was demanding on my time and there was just no way I was going to be baking up a slew of goodies. So I didn't. And guess what? Nothing happened. My parents didn't disown me, my friends didn't stop talking to me, my boyfriend didn't break up with me, and I didn't get fired. Later, when I went home for Christmas, at a time when I was finally on vacation, I made a batch of cinnamon buns on Christmas Eve and that was the extent of my Christmas baking. I felt totally relaxed and actually enjoyed what I was doing, rather than worrying about getting it over with so I could start the next thing. You know, it was just your regular run-of-the-mill neurotic type-A personality keepin' it real. I have carried this easygoing philosophy over to this Christmas, and only as the need has presented itself have I baked something. Thus far, there have been three events worthy of my superior efforts (ha! ), so here, on this third-day-of-Christmas celebration, I present to you a collection that represents my baking bliss. 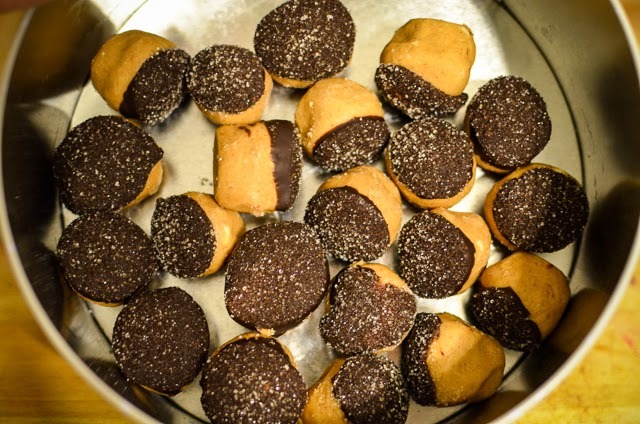 1) My Christmas cookie exchange at work eschewed the traditional cookie-exchange rules. Instead, the 12 of us baked two batches of whatever we wanted and then divvied everything up between ourselves. I baked the PEI Cookies (recipe and explanation of why the cookies have that name found HERE, on my blog) and Chocolate Peppermint Bark (from the 2009 Taste of Home Christmas Cookies and Candies recipe book). The cookies are a more challenging recipe while the bark is about as simple as it gets (both are delicious!). In a microwave-safe bowl, melt white chocolate at 70% power, stir until smooth. Repeat with chocolate chips. 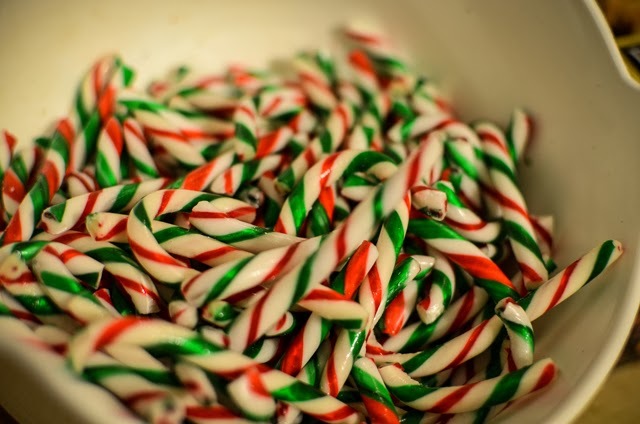 Stir 6 tablespoons of crushed candies into each bowl. Drop white chocolate and semisweet chocolate in alternating spoonfuls onto a waxed paper-lined baking sheet. With a metal spatula, cut through the chocolate to swirl, spreading to ¼-inch thickness. Sprinkle with remaining crushed candies. Chill until firm. Break into pieces. Store in an airtight container in the refrigerator. 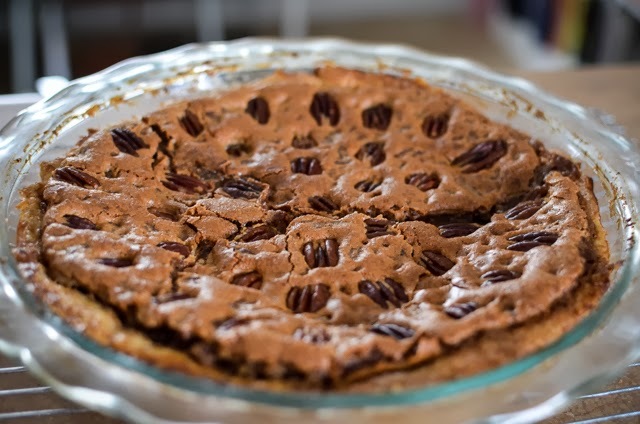 2) My boyfriend and I had a little Christmas dinner party last weekend, and I decided to attempt my first pecan pie. I was actually surprised at how well it turned out, and the recipes for both the crust and the pie filling are ones I will be using again. You can find the crust recipe I used HERE, on allrecipes.ca (I added a tablespoon of sugar and used half butter, half shortening), and the pie filling recipe HERE, also on allrecipes.ca (I made no significant alterations, other than to place pecan halves on the top of the pie). 3) My friend Lee and I have faithfully watched The Witches of East End all season, and since this past weekend was the finale, we honoured it with Spiced Christmas Mochas (his creation) and Sparkly Buckeyes (my creation, courtesy of the pullout “50 No-Bake Treats” booklet in Food Network Magazine, December 2013). “Sparkly Buckeyes” is definitely a suspect name, but if you call a spade a spade, they are just harmless little peanut butter balls. One of our favourite things to do during the holidays is to watch movies, lots and lots of movies. Like everyone else, we have our annual holiday must-sees, like Elf and Christmas Vacation, but we try to throw some new ones in the mix whenever we can too. Luckily, this year we found four that were released in the last two years that we had never seen! We've taken the liberty to screen them all for you, so you can consider them all Erin-and-Mike approved. Kick back with your mug of hot chocolate and tin of sugar cookies and enjoy! Released just this past September, All Is Bright stars two of my favourite actors, Paul Giamatti and Paul Rudd, as two Canadian ex-friends trying to sell Christmas trees in New York. The characters are a little more complicated than that, but the story is pleasantly simple and there's a dark humour that I found refreshing in a holiday film. People like to hate on Ed Burns sometimes, but I've always liked him and his movies, and The Fitzgerald Family Christmas is no exception. It's a touching story of the dynamics between seven siblings struggling to come to terms with the return of their estranged father on Christmas. Similar to All is Bright, it is somehow both melancholic and uplifting at the same time and thankfully doesn't stoop to sappiness like a lot of family dramas do. Arthur Christmas: this title is unfortunate — we had always dismissed it, thinking it was about Arthur, that educational TV series about an Aardvark. I'm so happy it's not. (Sorry, Arthur). It's a truly fantastic animated film that had these two adults giggling like little elves. I thought it was beautifully animated, smart, funny and touching (I'll admit I shed a tear at the end). I can only imagine its effect on kids! The fourth pick was a toss-up between Harold & Kumar and Rare Exports, which is basically a thriller about Santa Claus. It was shot beautifully and had me on the edge of my seat, but the ending was really strange and, let's face it, who really wants to watch a Christmas movie where Santa is the devil? Really. If that's your thing, by all means, watch this one. 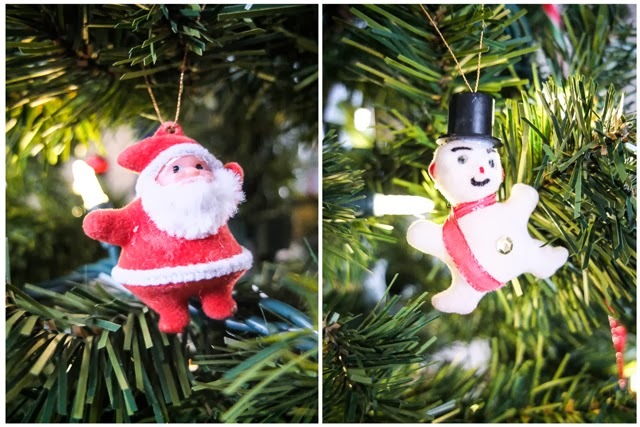 Last year I shared four of my favourite ornaments from my collection and you all seemed to like it. Well, at least Carla and Jill did. I'm not going to lie, I had fun reminiscing while I wrote it too. 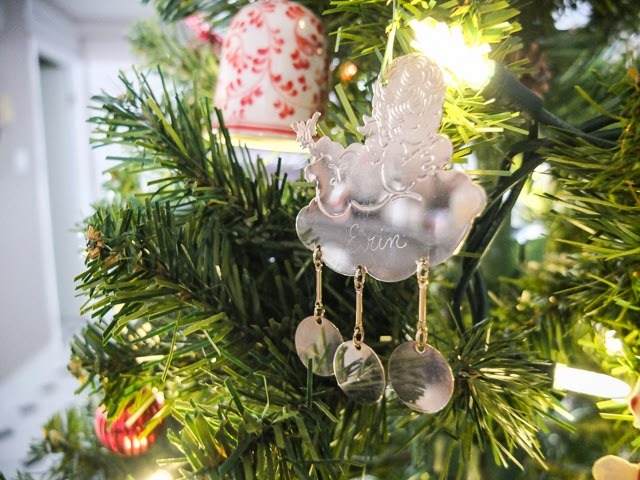 So this year I decided to share a few more of my favourite decorations and the stories they come with. The fun felted character above brings me so much joy, you don't even know. His name is Ronny and I picked him up from Lulu & Lavigne a few years ago. He keeps me company at my desk all day. And yes, I talk to him sometimes. So what? Mike and I picked this up from the market in Munich on our vacation this past summer. It made its way safe and sound in my backpack through five more countries, so you can imagine my heartbreak when I found it broken a couple weeks ago. How did that even happen? It doesn't matter, because thankfully I was able to glue it back together. It's such a sweet reminder of our travels. I call these creatures Ugly Santa and Creepy Snowman and they are hand-me-downs from Mike's childhood. They're pretty cute in their retro tackiness, don't you think? Whatever they are, they never fail to make us laugh every single year, so they will stay for as long as they remain in one piece. They come as a unit in my mind, so they count as one decoration, OK? This shiny engraved cupid was given to me by Mrs. Owens, an old family friend that lived next to the house I was born in. I only lived there for four years, but I can remember her home almost as clearly as my own at the time. She reminds me of tea, strawberries, the colour mauve and sewing -- when she passed away, her daughter gave us her sewing machine (and lots of mauve thread), which I used to teach myself to sew! I'm so happy to have this reminder of her. 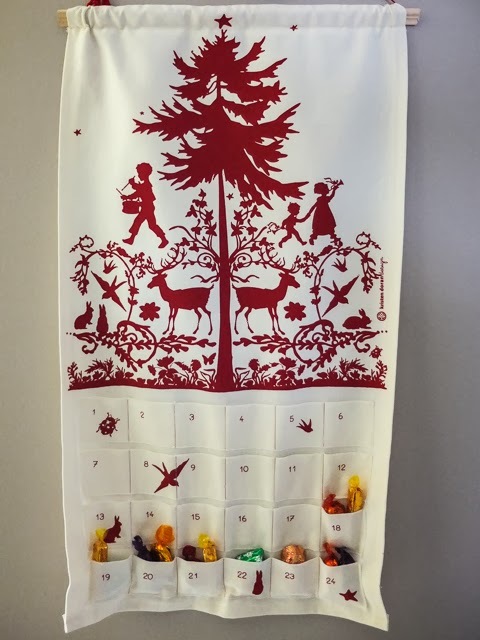 Last but not least, my advent calendar. I always had a boxed one growing up and loved prying open each little window, but what I have never liked is the cheapo chocolate that tastes like it's been sitting around since last Christmas. Bleh. So when I spotted this limited edition, hand printed one on Etsy a few years ago, I jumped on it and snagged the last one. I'm so glad I trusted my instinct because it is now one of my most favourite decorations. 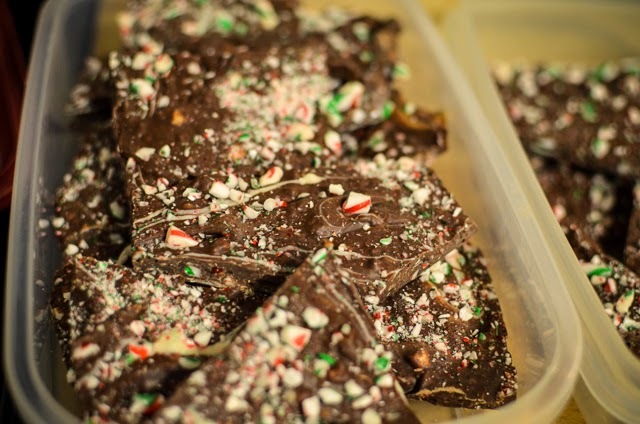 We've tried a few types of chocolate in it, but this year's Quality Street seems to be the winner, mostly because we can fit two candies in each pocket. Haha! Six more days... can you believe it? 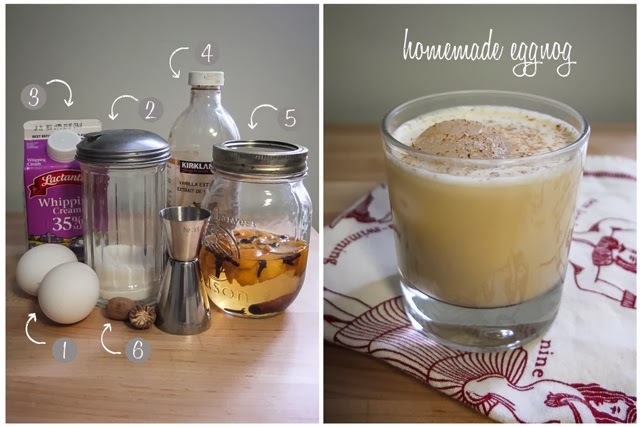 Eggnog is a funny drink. We can only bear to drink it for a few weeks out of the year and yet the holidays just wouldn't feel the same without it. Mike and I have been making our own for the past couple years, which tends to surprise most people. I guess they assume that it's difficult. Well, guess what? It's not! And I'm here to prove it. There are a million recipes out there, some that will tell you to do all manner of things like boil the cream or separate the eggs. But we don't do any of that and are happy as partridges in a pear tree with our nog. Plus, with our single-serve recipe you can make just one at a time and adjust the sugar or texture to your preference. So why not ditch the 99-cent carton of who-knows-what and treat yourself to a delicious glass of fresh homemade eggnog this holiday? Now wasn't that easy? Cheers! Cut a piece of fabric to 12" x 18.5". 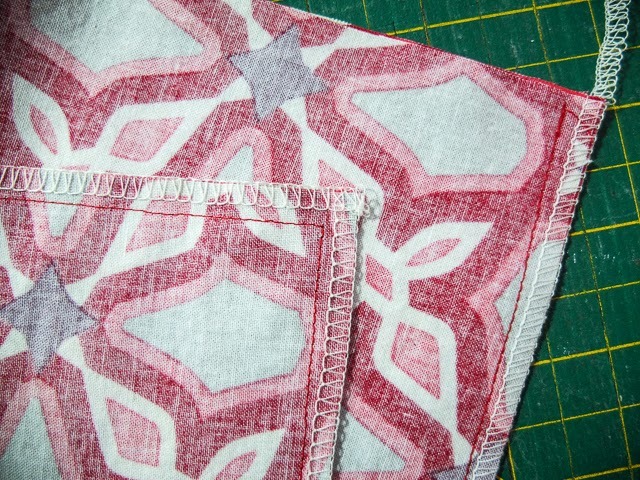 I like to use a rotary cutter and ruler for accuracy and speed, but fabric scissors will work just fine. 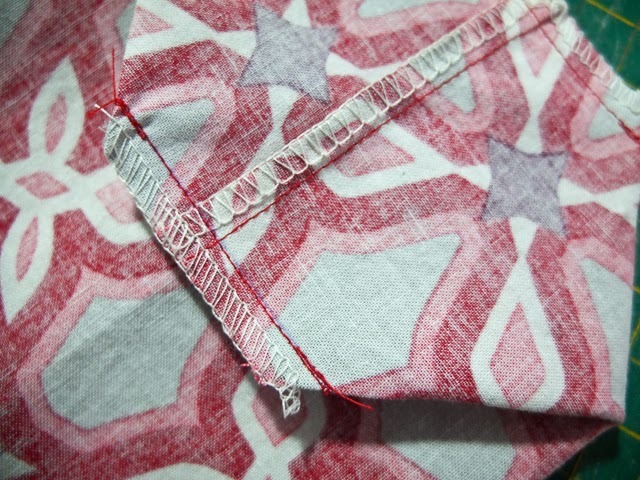 Fold the right sides together lengthwise and stitch a 1/4" seam along the long raw edge and across the bottom. Remember to back-stitch at the very end. One of the short ends should be left open. 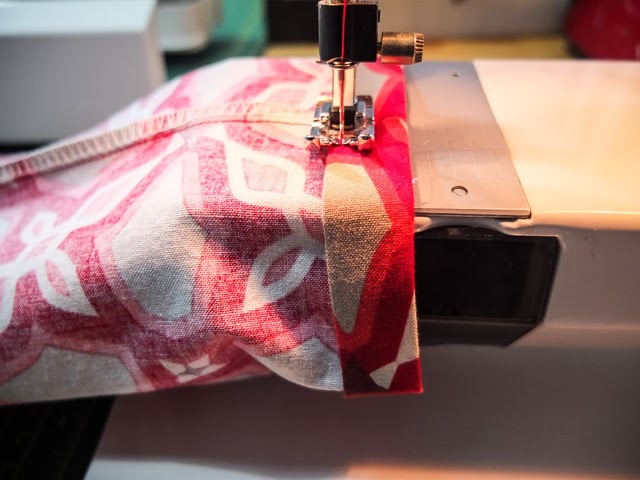 Finish the raw edges by using either a serger or a ziz-zag stitch on your sewing machine. Spread out the corners so that they lay flat. Draw a line 1 1/4" from the tip of the corner and pin it in place. Repeat for the opposite corner. 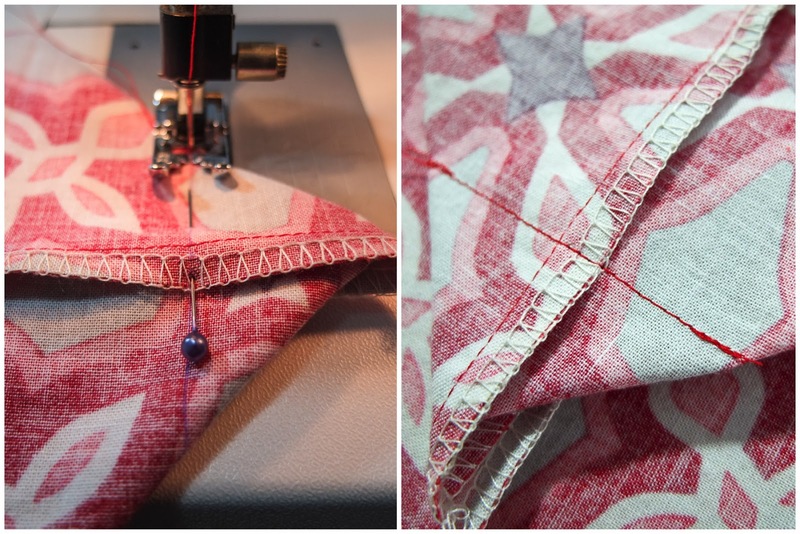 Stitch across the lines you just drew, back-stitching at the start and finish. 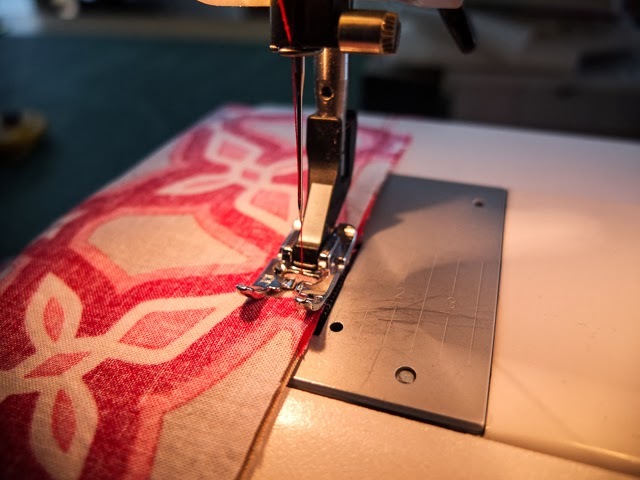 Trim the corners and finish the edges with a ziz-zag stitch, or use a serger to do both in one step. Fold the top edge 1/2" towards the wrong side and press. Fold over again 1/2" and press. 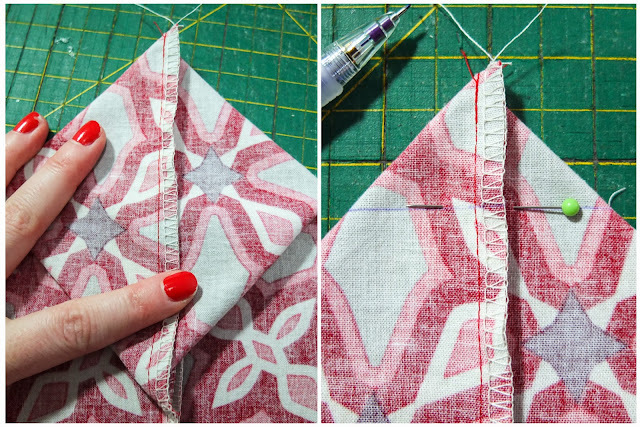 Stitch around the top, close to the lower fold. Turn it right side out and give your seams a final press. Cut some ribbon to a length of approximately 30". 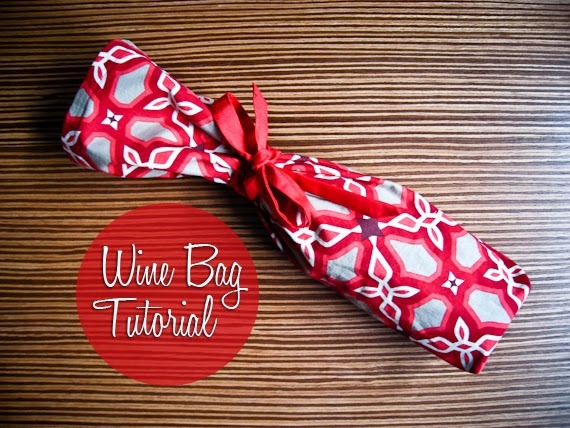 Pop a bottle of wine in there, tie a bow and you're done! Of course, if you don't want to bother making them, you could save yourself the effort and just buy them from me! Haha! I sell them in sets of 3 and in a wide variety of prints. DISCLAIMER: These take me 7 minutes to make. Obviously the timing for this project will vary depending on skill level and tools available, so please don't freak out if it takes a little (or a lot) longer than 7 minutes, especially if it is your first attempt. Stay calm, make a few for your friends and you'll get the hang of it quickly! 1. Red Tie: So I replaced my ratty old plaid red tie from last year's post with a red silk tie from a little local tie maker while in Budapest. It’s really nice and well made and all that, but I can’t seem to wear it out; the thing is too damn shiny, and shininess and glitter have been my lifelong nemeses. So I’m still on the hunt for a reddish tie I will actually wear, and this matte cotton one by Oh Good Heavens in I’d say burgundy (they say Plum), will more than do. Available at White Elephant. 2. Science of Good Cooking by Cook's Illustrated / America’s Test Kitchen: When I had this book out from the library, I felt like a food scientist. 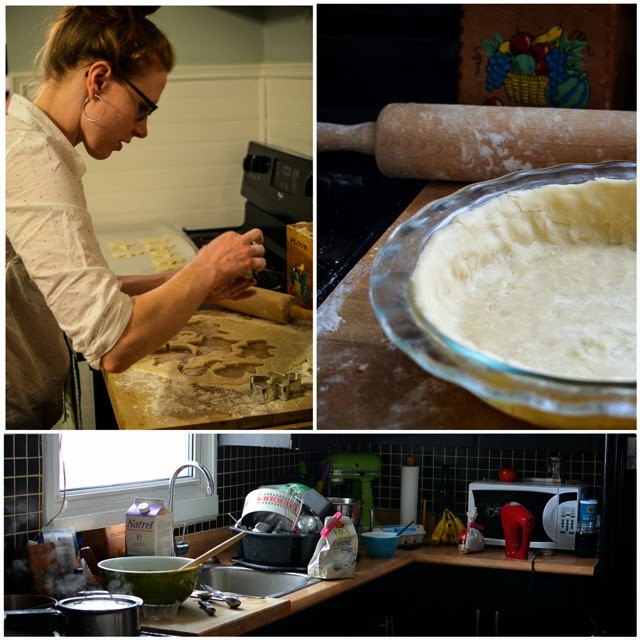 It was perfect for how I use cookbooks: more for referencing concepts; but it’s their experiments, which use scientific method to establish findings, that provides readers some really innovative recipe tweaks (Erin’s favourite example: Vodka Pie Dough) and completely won me over. You’re probably bored already, but this is the must have on my list. 3. Coffee Stuff: I’ve been doing french press coffee at home for a while now, and I mostly love it, but sometimes I could do without the sediment, and a-lot-of-the-time I could skip cleaning out the old grinds I neglected to clean out last week because I was busy damn-it! Can’t I just relax? 4. Wallet: These days I only keep a wallet in my bag, or as randoms like to comment, my purse, and going out to the bar equals a few cards and some cash in my pockets. Unfortunately, this leads to frantically rummaging through laundry come Monday morning. So yes, I need a slimmer "bar" wallet. Bellroy caught my eye because they added a neat pullout tab, and the instructional videos don’t hurt. 5. Outlier Toque: Outlier bike commuter gear is up there for most well-used clothing I’ve ever owed and remains a Christmas list staple for me. It’s too expensive to expect to receive, but it always looks pretty in the montage and you never know, someone could strike it rich one year. 8. Gloves: My merino glove was wounded in action during a particularly treacherous cold weather fishing trip in North Bay. Hooks and wool gloves should never be mingled, and all the duct tape and shoddy stitchwork in the world couldn’t stop the unravelling. It’s been cold enough this year to move to my cashmeres, but I’ve found a good pair of gloves in the more breathable merino are essential for between-seasons biking. Did you notice something missing from my wishlist the other day? 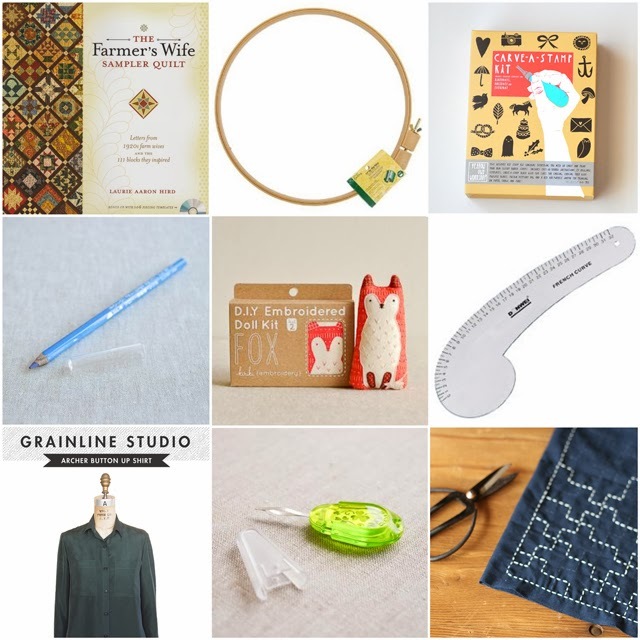 As I was putting these posts together, I quickly noticed that there were plenty craft-related items to make up their very own list. So here it is! I've been trying really hard this year to carve out more time for personal creativity and to learn new skills, like quilting, garment sewing, and embroidery, and I intend to carry that through into 2014, maybe even more so. These kits and tools will surely help. 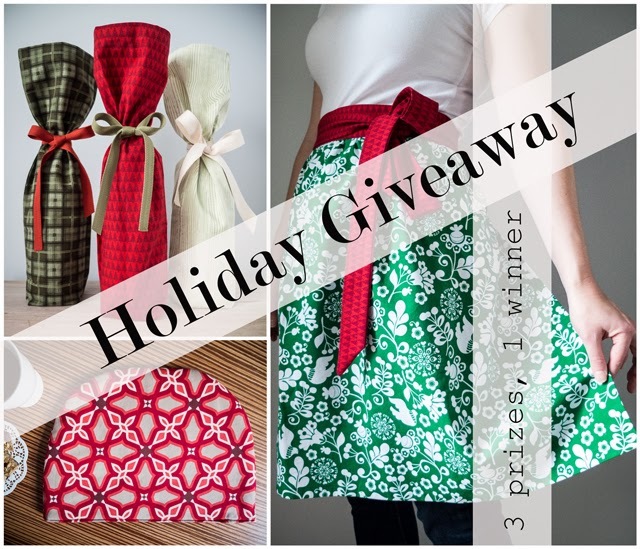 I hope they'll spark some ideas for the crafters on your list too! 1. The Farmer's Wife Sampler Quilt / I feel like I have the basics of quilting down now and need a book to inspire specific quilt patterns and blocks more than a how-to book. I've been admiring this one in Needlework for awhile and love that all of the block patterns are paired with letters from the 1920s! 2. Quilting Hoop / I intend to hand-quilt portions of the sampler quilt I've been making, which means I need a quilting hoop. Apparently the small embroidery ones will snap under the weight of a quilt. On the other hand, I'd kind of like to see that. 3. Carve-A-Stamp Kit by Yellow Owl Workshop / Who doesn't love stamps? 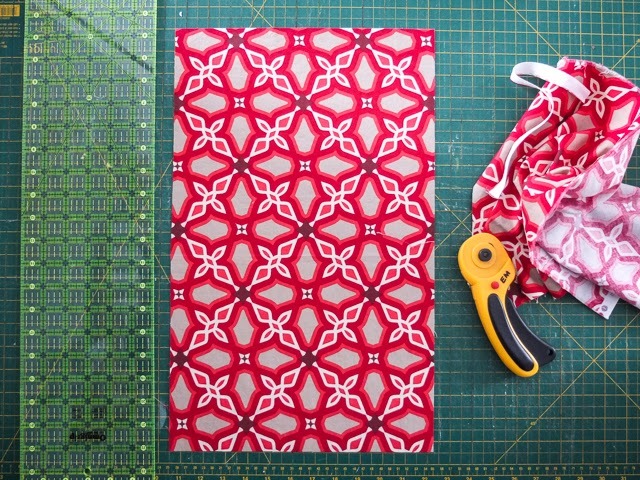 I immediately began imagining the fabric design possibilities (another skill I'd like to learn more about) when I spotted this in Mixed Media this week. Actually, Mike pointed it out. He knows me so well. 4. Iron-on Transfer Pencil / I still really struggle with fabric markings, especially when I have to trace embroidery designs and I'm always searching for the perfect tool to end my headaches. Could this be it? I'd love to give it a test drive at least. 5. Embroidered Doll Kit by Kiriki Press / Speaking of embroidery, despite all the custom embroidery I do for customers, my lettering only ever requires two stitches. I'd love an opportunity to learn more with a kit like this and make an adorable little toy in the process. The fox is my favourite. Available at Needlework. 6. French Curve Ruler / By the looks of things around here, I've become a ruler collector. What's one more? As you would expect, this type is helpful for drawing curved lines, which is useful when altering or drafting patterns. 7. Archer Button Up Shirt Pattern by Grainline Studios / This pattern is probably a little advanced for my skills, but a part of me really wants to try it. Maybe I'll make it a goal for 2014. A safer choice is this dress pattern by Pattern Runway -- there is a particular fabric I've been holding for over 10 years that is perfect for this dress. Who's judging the fabric hoarder now? 8. Embroidery Needle Threader / Threading needles makes me cry, especially when it's thick, multiple-strand embroidery thread. I've tried the little metal threaders, but they always snap after one use. 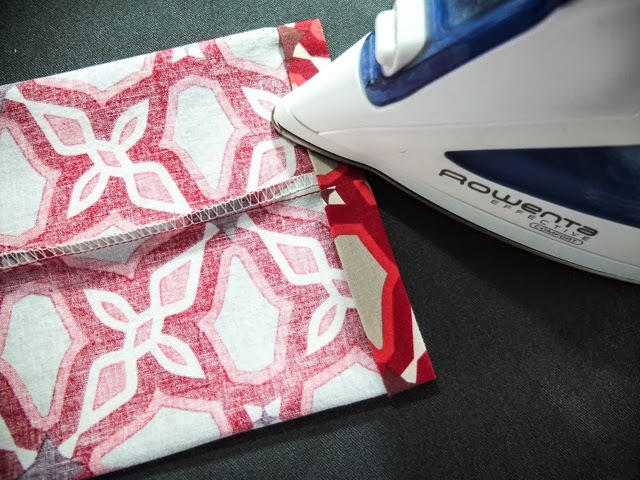 A tool has been created for every frustration in sewing, so I know there's a solution out there, and I've come to the conclusion that this is it. And if it doesn't work? It has to work. 9. Sashiko Kit / This is another embroidery kit I've been eyeing at Needlework for ages. Sashiko literally means "little stabs" and is a traditional Japanese stitching technique used on indigo cloth. I lived in Japan for a year and a half and seriously regret not searching out more textiles while I was there. This seems like a worthy compromise. Choosing the right book for somebody on your holiday list might not be an easy task, especially when there are thousands of titles to choose from. 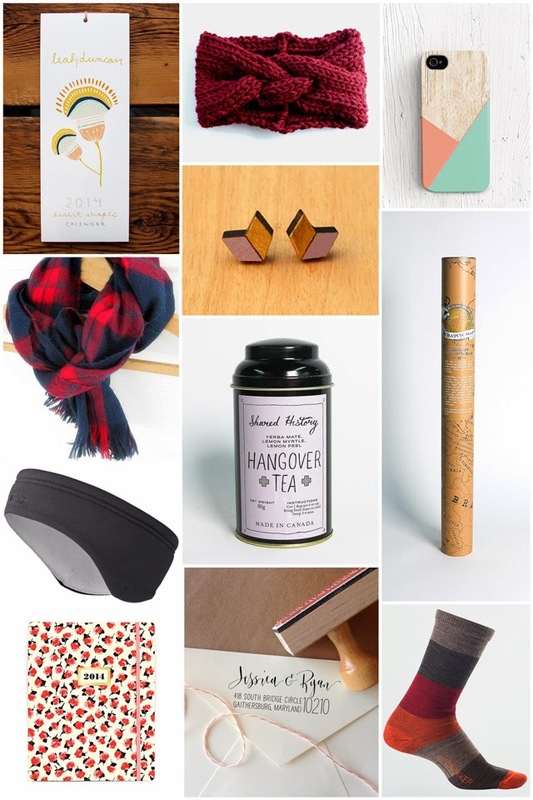 To make your holiday shopping just a little bit easier, why not commit to buying local? Here’s a list of ten books local to Hamilton for every kind of book lover on your list. Last month, the Hamilton Arts Council awarded the inaugural Kerry Schooley Book Award to Rachael Preston for The Fishers of Paradise. This self-published novel is one that we can all easily relate to, as it’s centred on family, choices, and the quest for happiness. 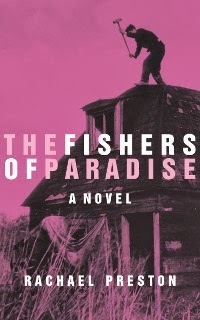 What makes The Fishers of Paradise especially unique is that it takes place in a setting Hamiltonians are very familiar with — Cootes Paradise. Many Hamiltonians don’t know it, but one of Canada’s largest rail disasters happened right here at home in 1857. 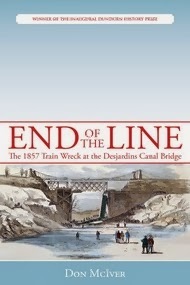 In End of the Line: The 1857 Train Wreck at the Desjardins Canal Bridge, Don McIver tells the tragic story of an ill-fated Toronto-to-Hamilton train that plummeted into the icy water of Desjardins Canal after a bridge collapsed. Among those killed were some of pre-Confederation Hamilton’s most prominent figures. 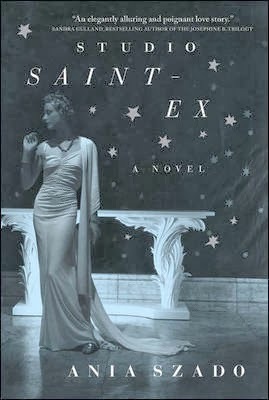 Set in 1940s Manhattan, Studio Saint-Ex by Ania Szado is one of those books you just can’t put down. At a time when the world is at war, young fashion designer Mignonne LaChappelle finds herself fighting a different type of battle — a love triangle. Hers is not just any love triangle. It involves writer Antoine Saint-Exupéry at the time when he is writing his most famous work, The Little Prince. In her recent release from Hamilton publisher Wolsak and Wynn, poet Catherine Graham experiments with an early Renaissance form of a poem known as a glosas. In a glosas, a poet weaves the opening four lines of a poet’s work into the last line of four ten-line stanzas. The result is Her Red Hair Rises with the Wings of Insects, a graceful fifth collection of poetry that pays tribute to poets P.K. Page and Dorothy Molloy. Who says history isn’t fun? 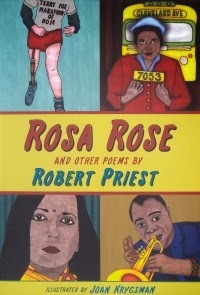 Rosa Parks and Other Poems by Robert Priest is a collection of poems that make history fun, celebrating heroes such as Rosa Parks, Elijah Harper, Terry Fox, and Deepa Metha. The collection features illustrations by Dundas’s Joan Krygsman. 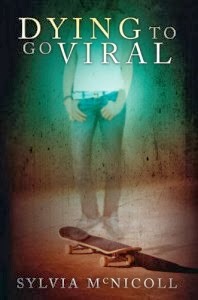 In Sylvia McNicoll’s latest offering, Dying to Go Viral, 14-year-old Jade will do anything to impress a popular older boy named Aiden. Unfortunately, this includes a daring stunt that ends in her tragic death. Luckily for Jade, this story has a supernatural twist, and she’s given a chance to go back to Earth to deal with some unfinished business. I’m the first to admit that even adults will be captivated by Jade’s story (I was!). Reporter Jon Wells has covered many grisly stories as a crime reporter at the Hamilton Spectator. In his seventh book, Death’s Shadows: True Tales of Homicide, Wells takes readers beyond the newspaper headlines of four Hamilton murders, providing updates and interviews with family members about some of the city’s most infamous crimes. 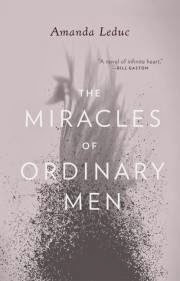 In two separate, yet connected tales, The Miracles of Ordinary Men by Hamilton’s Amanda Leduc tells the unlikely stories of two dreamers — Lilah, a wandering dreamer, and Sam, a teacher who somehow begins to grow wings. This book is the perfect gift for any reader who enjoys suspending belief and losing themselves in the impossible. Anyone who has ever lived in Hamilton and left it behind will relate to the coming-of-age stories in Jeffrey Luscombe’s Shirts and Skins. Though the book reads as a novel, each selection in this debut collection is a short story in and of itself. These linked stories tell the tales of protagonist Josh Moore, chronicling his years growing up in Hamilton, coming out, and the often turbulent relationships in families. 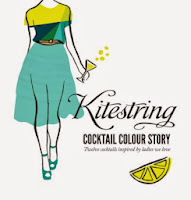 No holiday party is complete without the perfect cocktail, so Kitestring, a branding company in Hamilton, is serving up the Kitestring Colour Cocktail Story. This hardcover features recipes for twelve cocktails, among them some perfect for the holidays – like the Peppermintini (Need I say more!?). The best part about this book is that all proceeds go to the Canadian Cancer Society. Buying local also offers the opportunity to shop at one of Hamilton’s independent booksellers. Happy holidays and happy shopping! 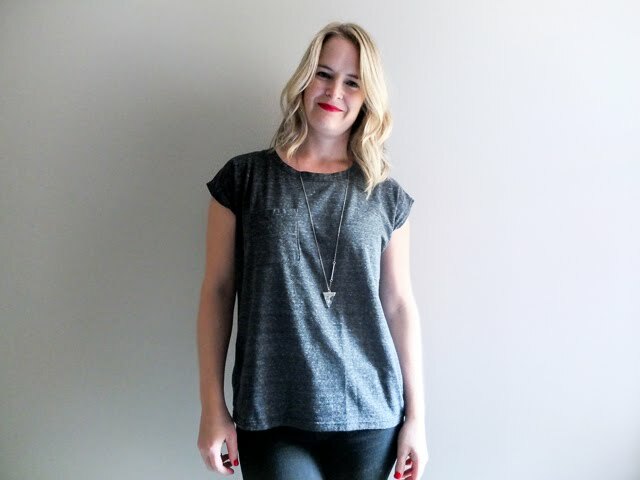 Jessica is a writer and editor who happily lives in downtown Hamilton. When she's not editing children's books, she's blogging at www.notmytypewriter.com or tweeting at @NotMyTypewriter. Jessica is also on the committee for gritLIT, Hamilton's literary festival, and she writes the "Shelf Life" column in Hamilton Magazine. 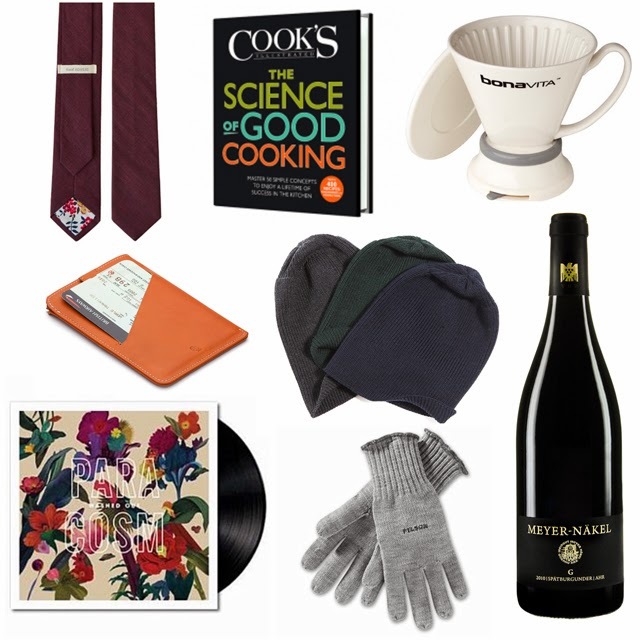 I'm not going to lie, I had a lot of fun putting together my wish list this year! In addition to (too much) surfing and pinning, I also spent a long lunch browsing my favourite local shops with the boyfriend in tow. I really didn't have time for that, but I did it anyway, and enjoyed every minute of it. On that self-indulgent note, I think you'll find my choices quite practical this year. Practically perfect, Mary might say. 1. I have absolutely loved looking up at my Leah Duncan calendar every day for the last year. But I do miss that tiny thrill on the first of ever month when you get to flip the page. So I'm grateful she came out with a 12-month version this year. 2. There are just certain hairstyles that don't work with a toque. Am I right, ladies? A headband seems like an ideal solution. This one is made by Westlake Designs in Toronto, but some even more local options are goodnight, day and Yarn Couture. I'd even settle for a ball of wool so I could make one myself. I'm not picky. 3. The only thing that makes me jealous of iPhone owners is the insane variety of cases they have to choose from. Well, I'm happy to say that I've noticed a few designers coming out with cases for Android phones. Like this sweet one from Ton Case. 4. I fell for these adorable little earrings by Ugly Bunny when I was browsing White Elephant the other day. 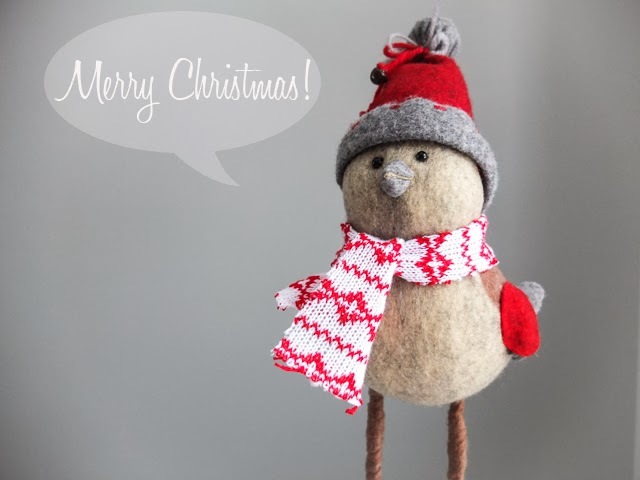 Her Etsy shop is closed for the holiday, but White Elephant has a large assortment! 5. Blame it on fashion bloggers, but I suddenly have an overwhelming need for a plaid wool scarf. I love that this one is from a vintage seller in Hamilton, and the colours are great, but I don't love that's it's acrylic. The person who braves the thrift stores and gifts me one of these is a gem. A real gem. 6. Yes, I run in the winter. And the only way to last longer than ten minutes out there without frostbite is to dress appropriately. I always wear my hair in a ponytail, so a headband is a necessity and the one I've been using just doesn't cut it anymore. According to the customer reviews, this one from MEC is just what I need to keep active all winter long. 7. Hangover tea. Need I say more? 8. For years I've been talking about a map art project to document our travels. We can never find anything we both agree on. This super cool scratch map might be it. 9. I've slowly been getting used to using an electronic calendar, but I'm still pretty attached to having a planner open on my desk. I always use a boring one that I get for free from work, but this one by Kate Spade is so gorgeous and worthier of all the amazing things that will be happening in 2014! 10. Speaking of amazing things happening in 2014, I have a feeling a custom address stamp will come in handy and the calligraphy on this one from Angelique Ink is just perfect. 11. Socks are a big deal in our house. They are discussed, tested and reviewed at length and I'm due for a few new pairs. My favourites are merino wool from Icebreaker, Smartwool and Teko. It's easy to get carried away this time of year, that's why my family has set spending limits and Mike and I stick to a stocking-only rule. However, as long as we're wishing and hoping, I figured I'd share a few extra luxury items that I am too in love with not to mention, but are all out of the budget. Way out. They also all conveniently combine to make one stunning outfit. Some would call that practical. Probably not Mary, though. 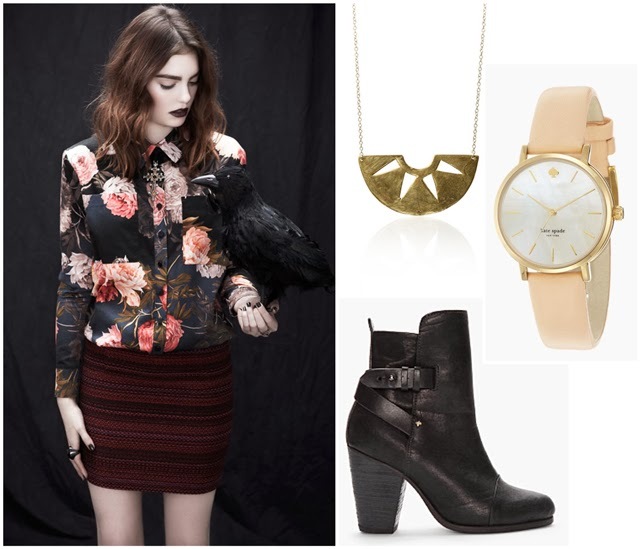 Eve Gravel Three of Joy Blouse $170 / I'm head over heels for this floral print. Are you surprised? There are a couple dresses at White Elephant in this print, but I don't actually wear that many dresses in the winter anymore, so I think this blouse would be the perfect compromise. Jasmine Virani Warrior Necklace $120 / What's with me and Warrior necklaces? May as well start a collection. Also spotted at White Elephant. Kate Spade Metro Watch $195 / I haven't worn a watch in at least five years, but I think I'm getting into them again, especially this minimalist style. So pretty. Rag & Bone Kinsey Boot $595 / "I will literally be the old woman who lived in her shoes!" In recent years, I've found myself complaining about how I can't get into the Christmas spirit. I blame global warming — to this Canadian girl, it's just not Christmas without snow. It was 12 degrees today, for goodness sake! Don't pretend you don't like a fluffy white wonderland too. Whatever the weather, it is still the first week of December, so I figured I better get proactive about things before my favourite holiday is over and done. So today I painted my fingernails candy cane red while I put together a playlist of new-to-me Christmas tunes. I've got to say, I'm feeling pretty jolly now. Hopefully it will do the trick for you too. Extra points if you pour yourself an eggnog and shop online while you listen. Tis the season for multitasking, after all. Haha! Enjoy! I am still looking for guest bloggers to help with the series. Please email me at dearednashop[at]gmail[dot]com if you're interested in contributing.